So one of the problems I've got with my current C5 project is that I've been struggling to get the chain tension right. According to the manual it should be OK (correct number of links of the correct size) but the chain always seemed to be excessively loose, and would periodically jump teeth under heavy load (i.e. pulling away up hill). It would also jump off the tensioner entirely if you go over a heavy bump. Removing a single link from the chain results in it being massively too tight, so things seem to point at the tensioner as the culprit. I've managed to get it to co-operate for the time being with a somewhat convoluted bodge involving cable ties and a small bungee cord, but that's obviously not a long-term solution! Could someone snap me a couple of photos of the tensioner so that I can see where it's actually meant to be sitting? I still have a sneaking suspicion that mine is missing something. Have you got a picture of the tensioner? We'll tell you if anything is missing. Like Dave says, Chas makes replacement tensioners that have guards to stop the chain coming off it. Thanks for the response. I reckon one of the upgraded tensioners will definitely be on the wish list shortly. This is where the tensioner sits if left to its own devices. Front of the C5 is top of the frame. Ignore the little black cable tie - this is just stopping the whole thing parting company with the bracket if it comes loose which it seems fond of doing. 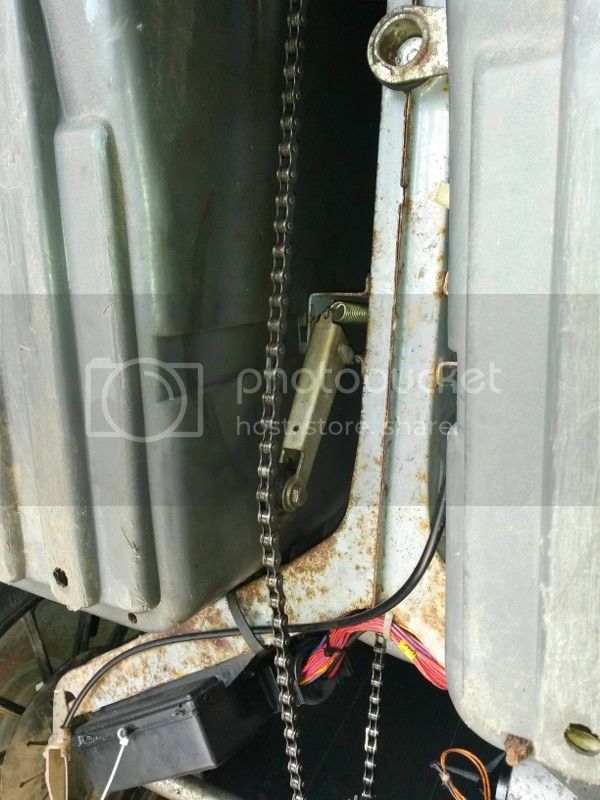 There is virtually no tension on the chain at all here and it will slip under any heavy load, and there's a 50/50 chance of it de-railing when you engage the motor. This is where it sits with a little tension added from the rear of the C5, which looks a much more sensible angle to me (it does tilt back a little further when the chain moves) and seems to work perfectly. 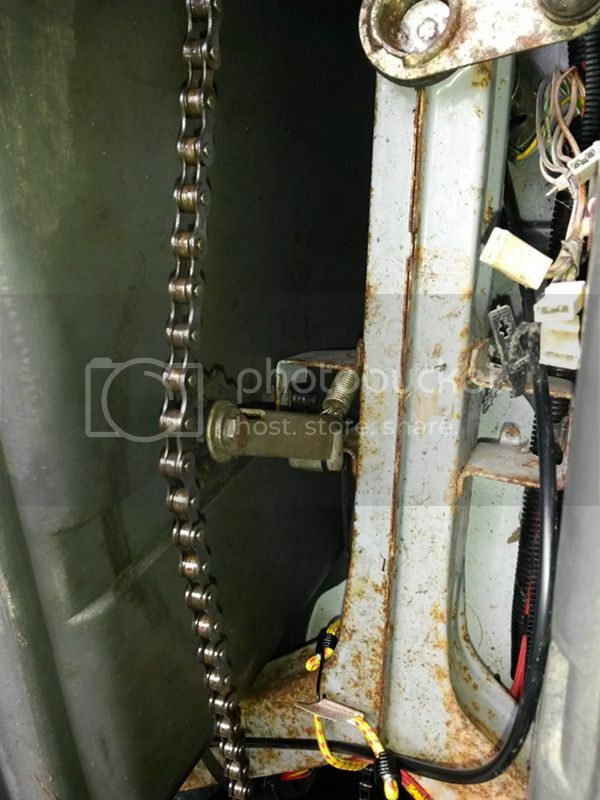 Chain tension is such that it doesn't slip and the chain has remained stable on the tensioner. Wonder if I'm missing a second spring or if someone has attached the tensioner backwards or something silly like that! Obviously the bungee isn't a permanent fix! Will double check the length. It's a brand new chain so shouldn't have stretched and links were counted when it was sized (link sized was noted from the documentation at the time). Removing any links results in the chain being as tight as a guitar string as I already tested that I thought. Will have another look later though. Cheers for that. 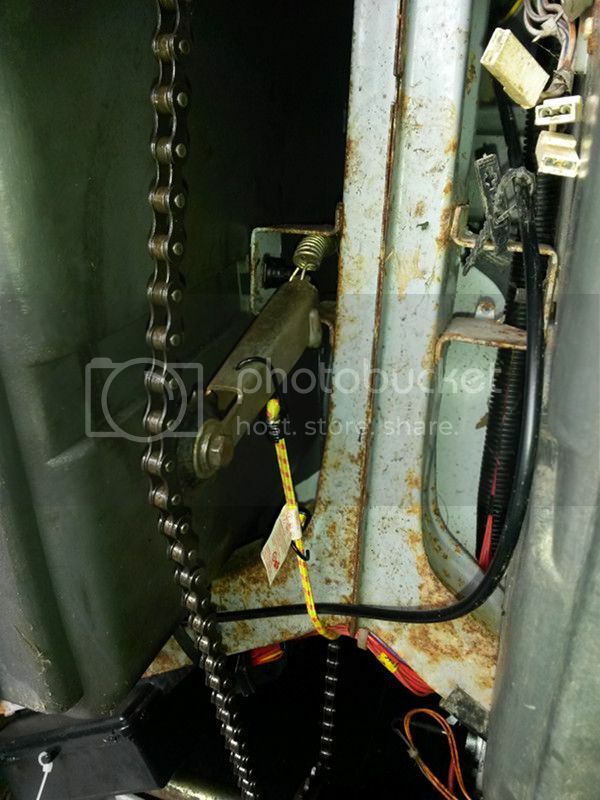 Curious to know what the way around that is short of finding new old stock chains, or modifying the tensioner anyway. Out at a friends place at the moment but will have a poke around with it when we get home. Interesting, not heard of a half link before. Will compare the current chain to the old one on the other C5 when I get home. Problem solved it appears. Took the chain off Wobbly today and sure enough it contained a half link. Managed to salvage it and transfer it to my current chain. Tension now seems much more sensible, especially now the spring on the tensioner is seated properly as well. Did a run of three miles or so today and it behaved much better. Whole thing popped out of the bracket once, but better than the dozen or so times it derailed or fell apart last time. Just think the U shaped bit is a little loose. Think a cable tie around the base should keep it together for the time being, though long term methinks that a new bracket will be the answer. Photo below shows how the chain is now sitting, which seems infinitely more sensible than it was before. Cheers for the help, never would have thought of the half link otherwise!